Wells Fargo's annual shareholder meeting was interrupted by an outburst from an angry investor who demanded answers from the embattled bank's board of directors. Marks, speaking out of turn at Wells Fargo's annual meeting in Florida on Tuesday, urged members of the board to "have the guts" to explain "whether you were complicit or incompetent" in their knowledge of the scandal where 5,300 employee were fired for creating some two million fake accounts. Wells Fargo (WFC) CEO Tim Sloan and Chairman Stephen Sanger both pleaded with Marks to sit down because he was out of order. "Wells Fargo has been out of order for years," Marks said. Sanger explained that Wells Fargo's board of directors launched an independent investigation that sought to answer questions about what the board knew about the up to two million fake accounts created and 5,300 workers fired as a result. Related: Wells Fargo scandal: Where was the board? Sanger suspended the meeting for about 10 minutes as Marks was removed by security and the bank tried to restore order. "Ultimately, he made a physical approach towards our board members. I'm sorry we had to do that," Sanger said once the meeting resumed. Another Wells Fargo shareholder later disputed that claim, saying Marks never approached the board. Sanger relented and said he would apologize to Marks if that was the case. The Wells Fargo meeting was interrupted by several angry shareholders who screamed at the board out of turn. The outbursts show how tensions are running high at the bank and investors demand accountability over the way the bank and its board of directors have handled the scandal. Though all off the directors of Wells Fargo's board were re-elected, some received unusually low levels of support. Preliminary vote totals show that four directors received less than 60% of the vote: Sanger, Federico Pena, Cynthia Milligan and Enrique Hernandez, Jr. That tepid support amounts to a strong reprimand from shareholders, given that the entire board was running unopposed. NYC Comptroller Scott Stringer, who voted against 10 Wells Fargo directors, called the outcome a "stunning rebuke" and evidence that "investors have lost faith" in the board. For his part, Sanger acknowledged that Wells Fargo shareholders "have sent the entire board a message of dissatisfaction" with their votes. "Let me assure you the board has heard that message," he said. Several shareholder watchdog groups had urged Wells Fargo investors to vote against the re-election of directors because they failed to provide adequate oversight over a sales culture that ran amok. Sanger acknowledged that Wells Fargo "violated trust" of its customers and employees. 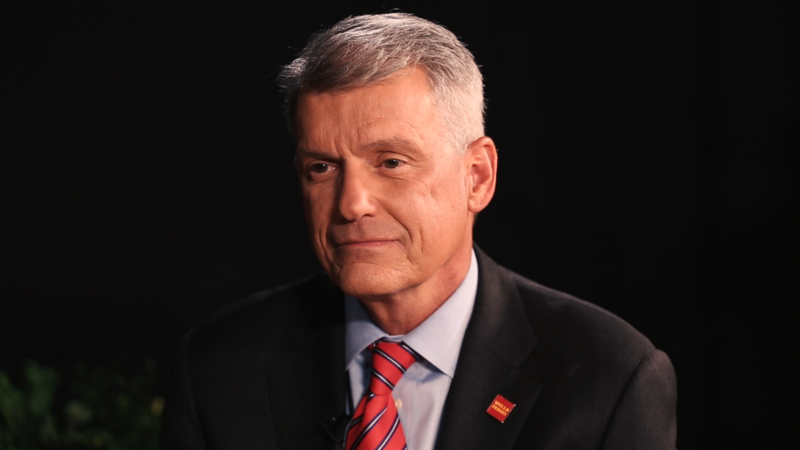 "For that, we are deeply sorry," the Wells Fargo chairman said. CEO Sloan, who joined the board in October after being named CEO, enjoyed support from 99% of the shares voted. The board's two new independent directors, Karen Peetz and Ronald Sargent, also received near-unanimous support. Sanger repeatedly declined to make individual directors available during the meeting to explain when they first learned of the fake accounts, explaining that he is speaking on behalf of the board. "You're defending the board, but who is defending the employees who got fired?" one shareholder said, noting the high-pressure culture and unrealistic sales goals. "There are thousands of employees who were terminated and who still live in fear now. Who is going to defend them?" Sanger responded by acknowledging the Wells Fargo culture "was off the rails" and said the board has tried to hold senior leaders accountable. Directors have clawed back $180 million in pay from former CEO John Stumpf, former retail bank chief Carrie Tolstedt and other executives. Still, several Wells Fargo shareholders slammed the board for failing to detect the problems in the sales culture earlier. "The Wells Fargo board has suffered from mushroom management. Like mushrooms, the board has been kept in the dark and fed horse manure," said Brandon Rees, deputy director of the office of investment for the AFL-CIO. Wells Fargo shareholders also approved KPMG's role as the bank's independent auditor, despite concerns over the firm's handling of the scandal and its oversight leading up to it. Democratic Senator Elizabeth Warren sent a letter on Tuesday saying KPMG "failed to prevent or even publicly disclose the fraud that affected hundreds of thousands of customers." Warren and her Democratic colleague Senator Edward Markey said it is "difficult to comprehend" how KPMG concluded the Wells Fargo scandal did not represent a breakdown in the bank's oversight process. KPMG has said it takes its role as Wells Fargo's auditor "very seriously" and its review of the bank's practices were appropriate.